HONG KONG — A super typhoon packing winds of up to 150 miles per hour is heading toward the Philippines, picking up speed over the Pacific on a route that also has Taiwan and the heavily populated southeastern coast of China in its sights. Super Typhoon Mangkhut is on track to hit the northern Philippines with its strongest winds on Friday before striking Taiwan and then possibly veering south toward Hong Kong and mainland China. As many as 43 million people could be exposed to cyclone-strength winds, according to the Global Disaster Alert and Coordination System. Its winds are expected to intensify Thursday and Friday — reaching speeds as high as 161 m.p.h. — before weakening Saturday, the Hong Kong Observatory said. It added that the typhoon “will pose considerable threat to the coast of Guangdong,” a coastal province in China with more than 100 million people. A super typhoon is characterized as a storm with sustained wind speeds of more than 150 m.p.h. The current track has the typhoon likely to brush northern Luzon, a less populated part of the largest island in the Philippines, which is home to the capital, Manila. In 2013, the Philippines was battered by Super Typhoon Haiyan, which killed more than 6,000 people and displaced hundreds of thousands. Mangkhut has already torn through the Marshall Islands and Guam, American territories in the Pacific. 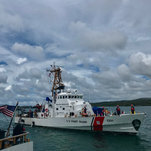 In Guam, 80 percent of the island lost power and there was widespread flooding, with Marines and sailors deployed to distribute emergency relief supplies. In the Philippines, the social welfare department has stockpiled food packs and medicine in northern Luzon in anticipation of the storm, while the military, the police and fire protection bureaus have been placed on high alert to respond to emergencies. The eastern side of the country was expected to get hit by strong rains and rough seas as the typhoon passed, said Ricardo Jalad, head of the Office of Civil Defense. Mr. Jalad urged provincial disaster relief agencies to keep the public informed about the storm’s potential. “Emphasis should be on proactive action — evacuation rather than rescue,” he said. He said that people living in the track of the storm had been told to stay indoors and to avoid swimming or crossing swollen rivers and creeks. The super typhoon is threatening coastlines just a week after another typhoon, Jebi, caused widespread destruction in Japan, submerging Osaka’s main airport, killing 11 people, injuring more than 400 others and leaving hundreds of thousands of people without power for days. Gerry Mullany reported from Hong Kong, and Felipe Villamor from Manila.